We are so excited to be able to share our upcoming Wedding with you at Isla Mujeres Palace. An adults only (18 and over), all-inclusive resort in gorgeous Isla Mujeres Mexico. Your presence means the world to us as we have the time of our lives and pledge our love to each other in paradise. Cheryl & Shea Bailey, of Yellow Umbrella Travel, a destination wedding travel agency, have been amazing with helping us with all the booking details. They have worked to secure a group rate with the resort and will be helping all of our guests book their travel accommodations for our wedding on May 4th, 2019. To be considered a part of Lindsay & Ryan’s Wedding Group, you must book through this group room block and not through any other method (even directly with the hotel). We offer competitive group rates and have secured a room block to make this as easy as possible. To participate in all of the wedding-related activities, you must stay at Isla Mujeres Palace as part of the wedding group. If you do not make your reservation within this room block, there will be an additional $204 per person to attend the wedding ceremony and related events (cocktail hour and reception). An initial deposit of only $100.00 per person is needed to reserve your room. Another 25% of your Reservation amount is due by January 17th, 2018. Full payment of you trip is due by February 15th, 2019. You may make any additional payments at any time up to the balance due date of February 15th, 2019. Isla Mujeres Palace is an intimate and elegant 62-room resort located on the island of Isla Mujeres. They consistently set the highest standards for All-Inclusive Resorts in Mexico. You’ll receive unparalleled service along with signature amenities. This is what sets the stage for an exceptional all-inclusive vacation. Luxurious accommodations, 24-hour room service, world-class dining, wireless Internet, in-room double whirlpool tubs, unlimited phone calls to the Continental U.S., Canada and landlines in Mexico, and more. Here, luxury comes standard and it’s all included! Special Wedding Group Rates have been secured and rooms have been blocked off with a contracted room block. Check the rates below and make your reservation today! There are a limited number of each room category in the room block contract. If you would like to upgrade to a different room category you have the option to do so based on availability, all you need to do is select the upgraded room category you are interested in when you fill out the room registration form. Prices are listed below. December 18th, 2018 is the deadline to get a guaranteed reserved room. Any reservation requests after that date are based on availability and not guaranteed. There is a 3 day minimum for all room blocks but you have the option to arrive early or stay later. You can select dates when you make your reservation. Depending on the number of nights you stay, you can receive up to a $1500 resort credit to use on excursions, the spa, golf, scuba, and more. Click here to see the options for this resort. Resort Credit is based on per room (not per person) per stay and is non-transferable and non-cumulative. Resort Credit has no commercial value, expires after 1 year, and is not subject to refund or credit. A 16% Taxes and fees apply for services redeemed and will be covered by each guest. For example, if you use $200 or Resort Credit you will have to pay $32 in Taxes and fees to the resort. Want to stay for Additional Nights? If you would like to arrive earlier than May 2nd or stay past May 5th, please let us know when you fill out the room reservation form so I can confirm availability with the resort. Gratuities are included but you may tip if you would like to. All meals and drinks at the Hotel including alcoholic beverages. Most on property sports and activities. Unlimited long-distance telephone calls to the Continental USA, Canada and Mexico. You will have the option to accept or decline the insurance during the reservation process. If you initially decline the insurance but would like to add it back, you have that option up until the final payment date of February 15th, 2019. There’s a maximum of 2 adults per room. Prices do not include Airfare or Travel Insurance. Sorry, this Room Category is no longer available. Isla Mujeres is an island off the coast of Cancun so you can expect the total travel time from Cancun International Airport to Isla Mujeres Palace to be about an hour and a half. We recommend booking a flight with arrival times from 8 a.m. – 8 p.m. as this is the ideal time to commute to the island. After going through Mexican immigration, pick up your luggage, and clear customs you will exit to a hall, where you will find different booths, please do not stop here. Walk all the way to the main gate, and exit outside, where you will find a Gray Line/ Airport Concierge By Mayaland representatives who will welcome you with a Classic Vacations sign, and take you to your transportation. Representatives will be dressed in navy blue pants and white shirts. They will take you to the pier for your boat ride (private catamaran or public Ultramar Ferry) over to Isla Mujeres Palace. For guests staying 3 or more nights at Isla Mujeres Palace, the resort includes a complimentary private catamaran service for up to 10 guests per boat ride (including luggage) that will deliver them straight to the resorts private dock! However, since space is limited to only 12 guests per boat ride, you must reserve your space as quickly as possible. In order to reserve your space, you must first send us your arrival and departure flight information. As soon as you have your flight information please submit it by filling out our Flight Info form here. This service is restricted to specified schedules and subject to weather conditions. Please check the catamaran schedule and restrictions below before you buy your plane ticket. When purchasing your flights make for sure you arrive early enough to get through customs, find your transportation and make it to the catamaran in time for your reserved seat. The resort reqests that you arrive at the Cancun airport 2 hours before your scheduled Catamaran departure due to possible immigration and traffic delays. The ride from the airport to Marina Hacienda del Mar is approximately a 35 – 45 minute drive depending on traffic but I would allow more time just in case. The last catamaran leaves for Isla Mujeres Palace at 5:15 pm. If you miss your slot you may have to take the public Ultramar Ferry and a taxi at your own expense to get to the resort. The catamaran rides are subject to weather conditions and within the specified schedule listed above. In the event that sea transportation from Marina Hacienda del Mar is not able to sail due to weather conditions, maintenance, or any other foreseeable or unforeseeable circumstances, guests will have to take the public Ultramar Ferry to Isla Mujeres and are responsible for their own ferry tickets and any taxis taken to the property. Also, sea transportation via the catamaran to and from Marina Hacienda del Mar does not operate on Wednesdays. If your flight is delayed, space on the next scheduled catarmaran would be subject to availability. However, if you are on the last scheduled ride and you cannot reach it, you will have to take the public Ultramar Ferry. If for some reason you arrive outside the listed catamaran schedule above, miss your reservation time, or the service is cancelled for any reason, you will have to take the Ultramar Ferry terminal in Puerto Juarez to Isla Mujeres and then catch a taxi to the resort. We recommend that your flight arrivial time into the Cancun Airport be no later than 8:00 pm. 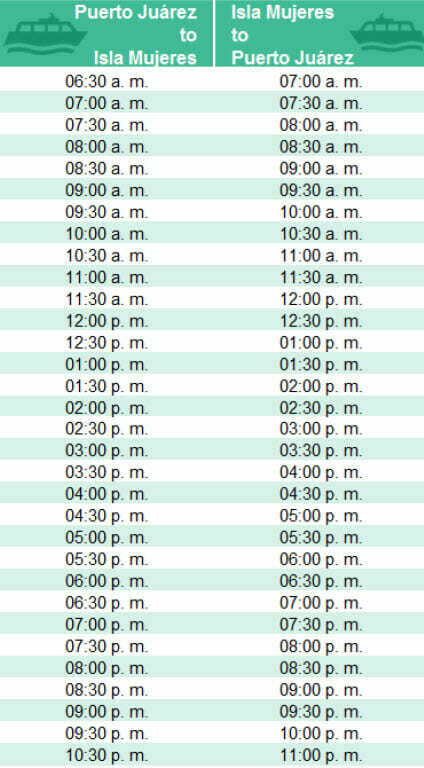 This is to make for sure you reach the last scheduled ferry to Isla Mujeres and in case of any flight delays no more than 1 hour. The Ultramar Ferry ride takes approximately 20 minutes to reach Isla Mujeres from Puerto Juarez. Once you step off the ferry, walk into the ferry terminal. At the exit on the left-hand side of the terminal you will find the taxi stop. Guests are responsible for transportation costs to the property (estimated transit time: 15 minutes). Please let the driver know that you will be staying at Isla Mujeres Palace. If you are taking the resort’s private catamaran back to the airport, it is strongly recommended that you be in the lobby 35 minutes prior to their programmed departure from Isla Mujeres Palace to Marina Hacienda del Mar. This allows sufficient time in the event of changes caused by weather conditions or otherwise. Restrictions apply for weddings and groups, because of the maximum capacity of the boat. If you are taking the Ultramar Ferry back you will have to catch a taxi to the pier. For outbound flights we recommend that the earliest you leave the resort for the airport be 9:00 a.m. Ferry service from Isla Mujeres is every 30 minutes from 5:30 a.m. to 9:00 p.m., then hourly from 9:00 p.m. to midnight. The last crossing to Puerto Juarez is at midnight. Ferry admission is not included and is your responsibility. Arrangements will be made with a Mayaland representative within 24 hours of your initial arrival. Depending on the location of your hotel, your pick-up will be 3.5-5 hours prior to your scheduled flight time (up to 2 hours transfer from Hotel to Airport + 3 hours in Airport). For departure, the representative will meet you at the pier. Gratuities are not included, and should be paid directly to the driver. It is customary to offer approximately $5 per person one-way, and $1 or $2 per bag, but it is at your discretion. Just the two of you on a breathtaking island soaking in sun, romantic dinners, poolside luxury, and beachfront bliss may be enough to keep you occupied and entertained. But…Isla Mujeres has a lot more to offer should you be so inclined. Get your pampering and primping on with a variety of couple’s spa treatments. Be bold and adventurous snorkeling, kayaking, or enjoying non-motorized water sports. Take a day tour to an exotic location. Stop by our state-of-the-art fitness center if you feel like toning. Spend the night taking in the majestic beauty of the island, or catch some mesmerizing live entertainment. Do everything, or laze around in luxury and do nothing with your honey. Love is in the air at Isla Mujeres—it’s truly a fantasy island. Yes, you can have it all in paradise: you can indulge and stay toned. Palace has multiple fitness centers, and ultra modern. Explore local flavor and wonders of nature with our exotic tours. Swim with dolphins, explore ancient Mayan ruins, kick back in secluded beaches where time stands still…and use the Resort Credit to pay for it all. Palace makes every night special through a bevy of nightly entertainment options like Karaoke and Fire shows just to name a few. Embrace the morning with a healthy or hearty breakfast beach-side, laze by the pool for delectable lunch, or dine under the stars for a romantic dinner. Isla Mujeres Palace is your palace, set the mood and we’ll curate the perfect culinary experience. It’s all here, masterfully prepared, just the way you love it, from healthy to hearty breakfasts, to an array of international flavor buffets, to serene starlit dinners. Enliven your senses with this traditional South American dish that boasts fresh seafood with zesty touches of lemon and pineapple, and smoky chili, chipotle, refried beans, and guacamole. Our presentation of this Latin delight adds a dash of Mexican flair to make it even more of a vibrant culinary experience. Ceviches and seafood, from 11:00 a.m. to 5:00 p.m.
Ease into the day in this casually elegant atmosphere for breakfast, or stop by for snacks or masterfully crafted cocktails.